A New Teaching Job. A New Subject. A New Imperative. I am beginning a new job this week! But, today, I am fluish, worn from a summer of traveling the world on a magnificent honeymoon, absent from today’s Professional Development session and trying to find my bearings. I am leaving the English classroom of a small charter school for the History Department of Taos High School. I have New Mexico, US, and World Histories to teach as well as the History of Film. I have a great deal of leeway, it seems, to attack the curriculum as I see fit. I have yet to speak with a teacher who says they can get through the curriculum past the Vietnam War. As well, no teacher has said they ever feel the time allows for them to study that period in any comprehensive way. So with WWI and WWII, the Great Depression and the New Deal, monopolies and Rockafellers, immigration and urbanization, there is not enough time to cover more than 100 or so years of history in one school year. I am anticipating the glossing over of an inexcusable amount of social history. So. I am going to start with the Struggle for Civil Rights and frame our history through that lens rather than risk omitting it from the curriculm. Backwards, forwards, everywhere at once: chronology and place do not matter. A lot has happened in a year. Last August, as we began our school year, the country was trying to piece together the tragedy in Ferguson. And as we tried to figure out the puzzle, tragedies and confusion mounted over the next 12 months. Names the country never knew came to light. Churches were targeted. A hashtag was launched. This year, we begin a new school year with fresh, but not new, tensions in Ferguson. You already know this. Let’s leap to education as one of the puzzle pieces. For the last two weeks, This American Life has grappled with a question regarding the achievement gap in American schools. Why do students of color, and most importantly black students as studied in the case of the first podcast, still lag so far behind their white counterparts. Highlighted was the school district Michael Brown graduated from three weeks prior to his death on a Ferguson street. Normandy. It was always a word of pride for American historians when we think of WWII and our heroes. But in this context? A terrible, terrible blight on equality and the state of public education. I could recount the podcasts, but you should listen to them. I could rattle off the discouraging and indicting statistics of neglect characterized by the marginalization of communities of color. I could explain to you how racism pervades in our American communities, or at least around St. Louis. I could explain how Americans fear change, or are too impatient to let it take real hold. It’s all troubling. And that’s why you should listen to it. You have a responsibility to know these things for yourself. In our Buzzfeed world, everything is curated second hand or speedily consumed. I will not make it so easy. Listening to the podcasts a bit late also coincided with Progressive golden boy Bernie Sanders getting jammed off the stage at an outdoor rally in Seattle by two women who affiliate themselves with the #BlackLivesMatter movement. There are so many angles to look at this, as no doubt you have seen online. The facts. The women were booed. Bernie left quietly, but now he has a black press secretary and a plan to address race issues comprehensively. The conjecture. The protesters weren’t actually affiliated with the BLM movement. Maybe there’s a conspiracy that the Clinton juggernaut supported or organized the protest. Wait, no props for the moment of silence for Michael Brown? Yeah, sure, but those women were too shrill for us to hear them! My biggest take away? Indeed those hot takes above. How we are digesting the protest as insight as to how we’ve digested our history. Think about it. The protesters were ridiculed and booed by a white audience at the event. Next, for compromising the attractiveness of a candidate, the two women were chastised online by a largely white Progressive electorate who thinks 70 year old white man Bernie Sanders is the only viable option in a circus of an election (still 14+ months away). Claiming the moral high ground, arguments developed that these women don’t respect that Bernie marched during Civil Rights campaigns in the 60s. Nothing acknowledging Marissa Johnson and Mara Willaford may have been right to push the politician on his platform for racial issues? By and large, the online media (including all of us on Facebook and Twitter) searches for holes in the protesters’ argument. The argument that Black Lives Matter is an organized entity worthy of respect. The argument that these two women even possess the intelligence and background to act with integrity and truth. The argument that this Presidential campaign for Sanders2016 even need to bother so publicly with issues for those of us with color when his platform already targets equality and the economy. Again though, BLM. Here’s some more reading from Imani Gandy. Once again, do your part and read this. Couple this take with your knowledge of Charleston, Sandra Bland, Eric Garner, and (once you’ve listened) the podcasts from TAL. Then try to tell me that protesting at the Sanders rally wasn’t an imperative for many of us to reckon with history. Try to enter a classroom and face students like mine, minority, poor, at-risk. Try to teach sincerely about a world that carries real opportunity for them. That the institution of State, at times even the institution of their own school, operates with their best interests in mind. Rather, go outside the classroom and express to communities of color that the institution of elections are colorblind. And on that voting front, Bernie Sanders supporters are complaining that they are not getting enough access to the media with exception to the negative press from Seattle. So in concerning ourselves with access, I say, in education, the economy, our universities, places of power and respect, people of color still do not have the access. Their access is prisons. Poverty. Marginalization. Boohoo about Bernie not getting coverage on CNN. His campaign will persevere. In fact, as we have learned from Obama’s 8 years, campaigning with coverage doesn’t matter a whole lot anyway. If the candidate you choose becomes President, what you vote for may never happen. If I take a second to look at them as my teachers, Ms. Johnson and Ms. Willaford protesting for a voice in national politics have the power to help me realize these truths of our history and present. I don’t need them to be right, just like I hope my students never blindly accept what I offer them. Or, better put to counter what is being pedaled on the Web, I don’t need their platform to be what I want it to be. Nor their Curriculum Vitae to be bulletproof. Nor do I need the satisfaction they protested the right way. If I demanded those ideals, and considering my whiteness, I would be abusing my privilege or defaulting to the racial ignorance pervasive in America. Both indefensible. Both everywhere on the Internet. But at least the teacher can tear open the fabric that colors how we imagine the American story. We can refuse the light coming through. Let it blind us and wildly take up the gospel. Or consume it in meaningful doses with pause to think, letting it refract over our experience to this point. More people, mostly of my background, either first hand or through a podcast, need to experience that this country is in dire need of a reckoning with its history and its future. I am thankful Bernie does not yet have the entourage that would discourage this type of protest because the disruption crystallized something important for me. Understand: recognizing the power of this protest action does not mean I was asleep or unmoved when Michael Brown was shot, nor complacent when Charleston happened, Baltimore, Bland…this protest and the popular reaction to it (as well the rest of our political circus) are daggers of reminder of how America doesn’t really get it. I want to believe in equality politics, too, Bernie supporters. But equity, in America, is pretty solid only in the sense that a lot of humans are left out of the ideal. Maybe a President can change that. Maybe a movement borne of a hashtag can change that. But nothing is as consistent in America like the uneven playing field we all deal with. So, in this moment of fervor and ignition, I envision an American History curriculum that begins with The Declaration of Independence. Then an excerpt from Claudia Rankine’s Citizen. And then a check in with Arizona’s white washed curriculum. Then a reminder what’s good up in Pine Ridge. 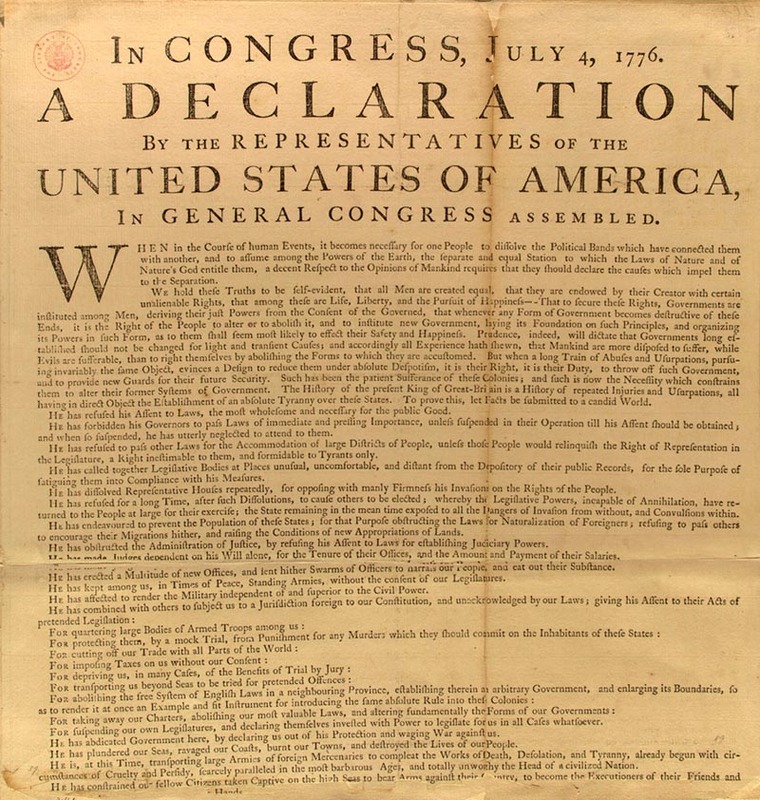 Then we will return back to The Declaration of Independence, the cornerstone of America, and remix a new version of the document from those voices that usually do not have access to it. Then we’ll give it to you and see what light you can take from it. Continually with this world, I am at a loss. I think that’s an important quality that I can carry into the classroom because I think this temper of loss manifests itself in many ways. I am a person filled with both wonder and bewilderment. One I see as a stand of capacity and opportunity. The other I take as a feeling of confusion and a posture of exasperation. In this day and age, people are always two things at once. At least two. And in this moment, in these trying days for my underserved community and at-risk students, I am white. And I am male. I am cognizant these distinctions help me access the world in ways others cannot. But I am also gentle and a poet. So I am vulnerable and sensitive. These help me access the world and those around me in ways that see through, or beyond, or into. From eight years of teaching in northern New Mexico, I have a pretty strong idea of what my whiteness and maleness represents to my students: I am powerful, authoritarian, wealthy, worldly, and decidedly other. I was conscious of these facts from day one and I continue to grapple with them as to how I can better serve these young people. Trust is a key to working together. And in light of those five descriptors associated with my skin-deep identity, I have had to work earnestly and tirelessly to earn that trust from my students and the larger Taos community. I have struggled to do so at times, as in when I have believed myself actions to come from the courage and vulnerability associated with being a teacher in the twenty-first century only to be stopped in my tracks by distrust or my ignorance. My students, when they are most lost and struggling for their own answers, revert to seeing the world in that we/other binary that separates us. Of course, neither of us are conscious of this in the moment of our conflict or misunderstanding, but the mention of how I am treating them because of their brownness or my perceived authority always amps our emotional responses as we try to work through a challenge. I also know that my students only do this when they are on the defensive. And after years of moving first with compassion or humor or understanding, I have established the level of trust that allows us to cut to the bone more quickly and efficiently. This way we can more effectively tackle the education system that so often marginalizes these young people with such heartbreaking efficiency. I am blessed to have this sort of working relationship with my students. But as their life circumstances conspire against them (homelessness, divorce, illness or loss, addiction or depression, teen pregnancy or abandonment, and often a cruel cocktail of many factors), their perception of the world devolves into the simplest, but deepest, separation of us. Overtly or not, they’ll deflect the support into an attack because of their skin color because they don’t want to be accountable…to me. After the initial shock and spike, we’re able to find the common ground that supports us in our shared goal: the sparkling, if not beleaguered graduate. I am lucky enough to have the patience to weather that storm of misunderstanding and see through that student’s shield. After all they are mostly protecting the wounds from past injustices. Whether they were inflicted against my students and whether or not they were carried out by me, those wounds are legitimate and often generational. This is a critical understanding I must carry into every workday in that my job is one of participating within and repairing a world that I had no part in creating. It is a razor-thin double-edge. But also, I am also operating within a classroom, where safety and positivity and the belief in opportunity are fundamental to our work. I am not working a beat or street corner. I am lucky in that I have not had to push something illicit to make a living, and that I am not sworn to protect those streets. On both sides of that coin we find Michael Brown and Darren Wilson, two young men who found themselves in an extraordinary, but an increasingly common, moment where souls intersect and collide for all our world to see. And here is where I am at a loss. As a teacher, how do I contribute to a world where this generation operates beyond the fear and explosiveness that define the deeper associations to the names Travyon and Zimmerman? Tamir. Fruitvale. Garner. I am talking about associations beyond the umbrella term of racism. I am talking about: Why was George Zimmerman so afraid that he was compelled to follow a young black boy through his neighborhood? Why do police officers solve their disputes with firearms in communities where the police and people are of different colors? I am not ready to assert the answers to the questions are solely based upon racism. But then, a counterpoint: How are fears racist? How can I tackle these issues of identity and association head on? Our communities of color, my school, need answers. My students do not live in a world like Ferguson, but Ferguson reinforces what my insular community understands of how the world works. And I do not want my students fearful of entering a world that sees them as only Indian or simply Brown. I want them to emerge from high school ready to live anywhere and do anything. I want them to live their dreams. And now I wonder how naïve that is. The access that I have to the world beyond where I grew up is an opportunity that everyone has, but it is a privilege that I can take advantage of that opportunity and enjoy living anywhere, even as a minority. I have been aware of this as I work as a teacher in my community. But never has it been so painful and obvious. I want to create a different world with my students because I am beyond expecting this one to change for them. We have to play the long game and trust each generation will be subsequently less and less lost.